I am sure everyone in India has a personal TATA story to tell. For instance, once when I just wanted to get away on a solo trip to think, I opted for TATA plantations in Coorg, near Bangalore, Karnataka. The brand name TATA meant, that I would be safe, even if in a strange cottage all alone. Yet, surprisingly, outside India, people associate TATA with say Corus or Jaguar and not with TATA Tea. 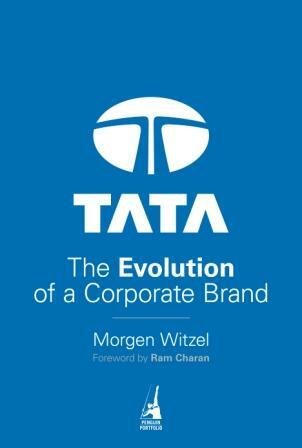 This book - TATA: The evolution of a corporate brand shows how TATA, as a group has evolved over a period of time. It has built on its foundation and also in the course of its way, added various other 'brand values'. I realised that Chartered Accountants could learn a lot from this book. Hence, after a very long gap, I reviewed this book for the Bombay Chartered Accountants' Society and it was published in their September journal. If you need to learn how to build your own brand, do pick up this book. The review is pasted below. Readers may wonder why I am reviewing a book based on a specific group i.e. TATA for our Journal. True, most of us in India have a TATA story to relate, some at a personal level, others at a broader level. India rejoiced when TATA acquired Corus or Jaguar. Nano has and will continue make many a dream come true, even as competitors are now coming up with smaller cars. This book review relates largely to what brand lessons we as individual chartered accountants or firms of chartered accountants can learn from the TATA story, which is succulently captured in the book: “TATA: The evolution of a corporate brand” by Morgen Witzel. Many of us scoff at the word, ‘brand building’. We think we are professionals and should automatically be recognized for wearing the CA badge. However, in many spheres, we compete with ‘other professionals’ from a different field. Thus, ‘brand building’ is essential at a broader level. Further, within the CA community as well, it is essential to stand out for one’s knowledge or unique set of offerings, or qualities or any other attribute which can be a USP, whether one is in practice or in the industry. A brand, is largely a sum total of perception. But perception takes time to build. More-so once a good perception (brand) is build, the public scrutiny intensifies. You really cannot rest on your laurels. In the 1990s, the task was not so much to create cultural change as to steer the TATA group back to its original culture and values. This was not easy but it was done. The TATA group could then create a brand based on its existing culture, rather than having to undertake the immeasurably harder task of creating a brand and then bringing the culture into alignment with it. Indian customers see TATA as trustworthy, safe, reliable, a provider of value for money and at the same time innovative, modern and stylish. Innovation and keeping in tune with the changing needs of its stakeholders did not mean that TATA diluted its past heritage of safety, reliability and trustworthiness; rather it took strength from its past heritage. Initially as the author began his study and research he found that three key values lay at the heart of the TATA corporate brand: trust, reliability (especially in terms of quality and value for money) and service to the community. These were the three things that a broad spectrum of stakeholders mentioned first and most often. As the story progressed the list expanded to cover seven facets, viz: service to the community; trust and integrity; fairness and responsibility; innovation and entrepreneurship; global aspiration; quality and value for money (reliability) and lastly perception of goodness. Similarly, we CAs need to draw on our rich heritage and at the same time, keep pace with the times. What would be the heritage that a CA can draw upon? While I can lay down quite a few attributes, yet integrity and reliability come uppermost to mind. Not only collective efforts, such as those by BCAS but also individual efforts, say: in training juniors or for that matter constantly checking our course of action while conducting our professional duties will ensure that this attribute for CAs remains strong in the minds of the stakeholders. At the same time there is a need to change, to develop new skills – not just technical skills, such as by keeping pace with changing tax policies in key jurisdictions, but also soft skills such as better communication; innovating ways of doing things – even in mundane things such as filing , such as by introducing a proper checklist of documents that should be kept on record; of forming alliances whether formal or informal to ensure that the best possible comprehensive service is available to clients. The areas for introducing change, for upgrading (to use the term) are endless and we need to determine, after conducting a SWOT analysis, what exactly are our weakness and/or where we need to grow. Being perceived as contemporary is also crucial in the broader sense. Today, especially after what has been perceived as tough final examination results, youngsters are increasingly giving a second thought while contemplating a CA course. The ICAI has tried to keep its syllabus contemporary. But the challenge lies in showing that the “CA profession is not my father’s profession, but can be my profession”. The answer to that lies in ensuring that CAs are not merely regarded as bean counters but that they play an important role in a client’s business strategies or the business strategies of their employer (if they are in industry). Another concept which is alive at the TATA group and which greatly impressed me, is the ‘Dare to Try’ campaign which began in 2007 and which offers awards and recognition to employees who come up with innovative ideas, that for one reason or another, have not taken off – such as lightweight plastic car doors by a team at Tata Motors or flavored capsules for adding flavor to water or other beverages by Tata Tetley’s team. The entire objective is to be make innovation part of the eco-system. Rewards for suggestions to create a better eco-system in a CA firm or community need not be monetary. Sometimes, recognition counts or rather plays a greater role. There are instances in this book which show that no one is immune from mistakes, but the important part is how we tackle these mistakes. When Indica was launched there were some technical glitches and parts were replaced for free. Once the glitches were tackled Indica V2 was thereafter launched which has become a popular car. Brand building is not a dirty word. It is the sum total of what you stand for. “A corporate brand is not what you say it is. It is what you are” cites the author. In other words you have to walk the talk. The same applies to us CAs. The table below contains some suggestions regarding the brand attributes for a CA, I am sure you can select from this list, add your own and strive to evolve, if required, to tackle the challenges of a changing environment.